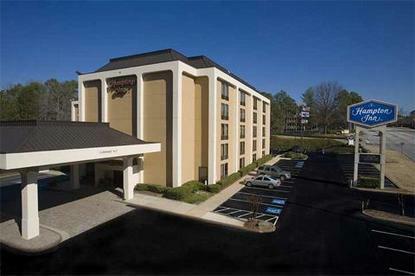 The Hampton Inn Northlake is located only 10 miles east of Downtown Atlanta and nestled in the Northlake Office Park, with easy access to major businesses and Interstate I-285, making the Hampton Inn Northlake the perfect location for any business and leisure traveler. You will enjoy all the amenities that you would expect to find at Hampton Inn. We start your day off right with a deluxe, complimentary hot breakfast. You will enjoy the convenience of a number of Complimentary amenities such as wireless High-Speed Internet access, local phone calls and USA Today (Mon-Fri). Additionally, all of our guest rooms are comfortably furnished with coffee makers, iron and ironing boards, hairdryers, voicemail services and of course our 100% Hampton Guarantee. We feature 5-stories, 129 guest rooms (85% non-smoking), outdoor pool, fitness center passes, and meeting space for up to 30 people. Amenities include complimentary continental breakfast, free local calls, and On Command TV with HBO. We also offer connecting rooms, cribs, hair dryers, irons and ironing boards. Laundry/valet services, meeting/banquet facilities, rollaway beds, and refrigerators are available for a nominal fee.